I grow lemon peppers – aji limon – by the cartload (kinda) because 1) I depend on them for bean soup (preserved in sherry – add 2 peppers per 3-quart pot of soup) and 2) – and more important – our son, Matt, spends the weekend with us at the end of summer and uses a boatload to make lemon pepper relish. Lemon peppers are not hybrid so you can save the seed and have it come true (i.e. produce the same fruits) the following year, something our friend, Theresa Mycek, manager of Colchester CSA has been doing since I first gave her a packet of seeds several years ago. The lemon peppers are about as hot as jalapenos (which is about 5,000 Scoville units) but taste different from a jalapeno. They have a distinctive lemony-smoky flavor that adds wonderfully to a host of things, including the jerk chicken we put on the grill last night and served with pineapple salsa (made with our own fish peppers), which absolutely makes the dish*. 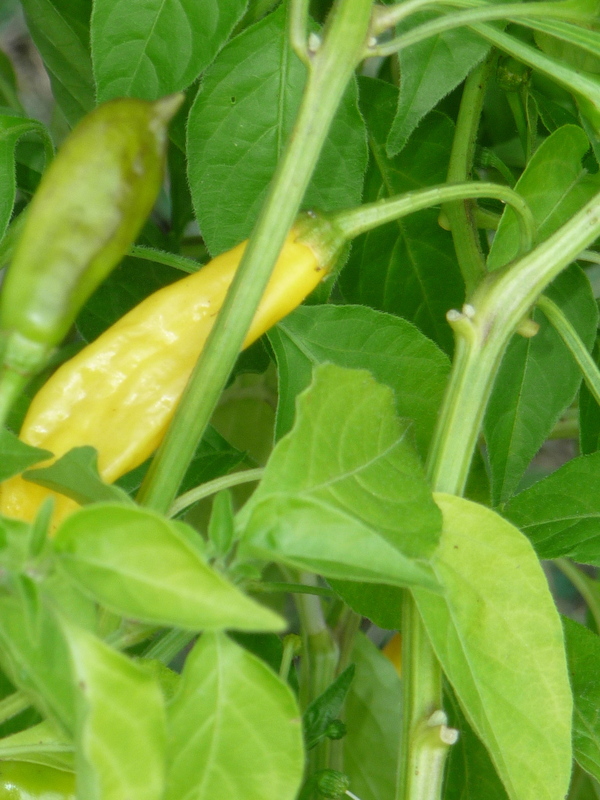 Lemon peppers are also beautiful, hanging from the thigh-high bush like lemon-colored Christmas ornaments. I plant way more than I need because of Matt’s annual lemon pepper relish production, and because they produce so beautifully at the end of the summer when the rest of the summer vegetables are winding down or have collapsed altogether. We put lemon pepper relish on fish tacos. Matt probably puts it on everything — scrambled eggs, quesadillas, minestrone, pudding whatever — but of course his capsaicin capacity way outstrips ours. The relish, which is predominantly ground fresh peppers simmered with seasonings, is a big hit of aji limon with each demi-teaspoon. 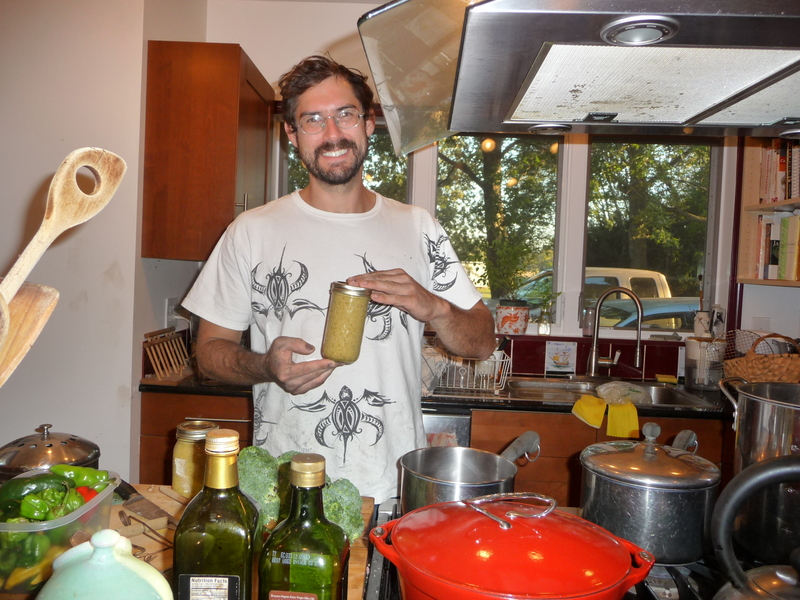 As a result, we use it sparingly, so can take a year to get through a 10-pounce jar of the stuff whereas Matt goes through about 2 quarts a year. Having said that, he loves to share so has been trying to figure out a balance between maintaining the character of the peppers and not assaulting the taste buds of his family and friends. “I like it really hot, but I want to share it with other people who will really enjoy it and see how awesome it is,” he laughs. A food processor is a huge help in the production. He de-stems piles of fresh-picked peppers, then grinds them whole with big chunks of fresh whole garlic. That goes into the pot to simmer with a big splash of white vinegar. He then processes plenty of fresh squeezed lime juice and fresh cilantro together, adds a fair lick of Kosher salt, then adds that to the pot and simmers it for about 40 minutes. 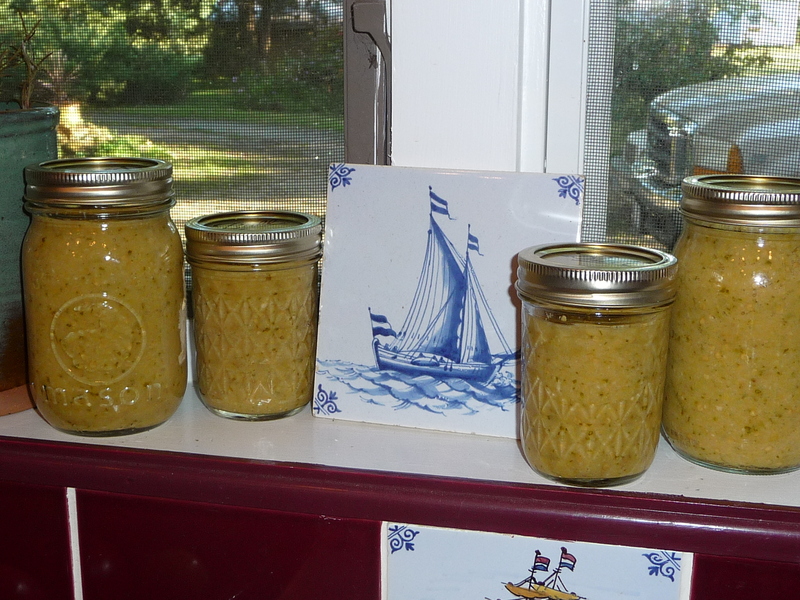 When sufficiently simmered, it goes into sterilized jars for processing. This year, he used way more garlic than in previous years – big bulbs of fresh hardneck roja that he got from Theresa. He’s been playing with the recipe (he’s a handful of this, pinch of that kinda cook), for a couple of years now. I haven’t tasted it yet, but it smelled fabulous. Fish tacos here we come. *The recipe for jerk chicken and its marinade along with pineapple salsa is in the Gourmet Cookbook. We think it’s something really special, especially when you sit outside with friends by the grill and have laughter and conversation over an end-of-season margarita before you sit down to the meal.